I’ve followed this series from the time when book #1 came out in paperback, probably in 1999 or 2000. 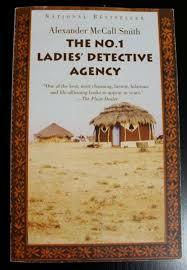 It was titled The #1 Ladies Detective Agency. After that first sample, I got hard covers shortly after they were released until I started listening in 2007 – then it was the day of release. 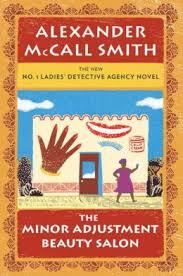 Although there are always one or two little crimes for the “traditionally built” protagonist, Mme Precious Ramotswe of Gaborone, Botswana to resolve, these books are NOT conventional mysteries. The relationships between the characters are far more important than the crimes our detectives have to deal with. For what it’s worth, the first book had incredible reviews and the series has got received very good reviews over the years. I would highly recommend starting at book 1 and working your way through in order because the primary relationships build. In The Minor Adjustment Beauty Salon Mme Ramotswe’s assistant, Mma Grace Makutsi, now married to Phuti Radiphuti, is pregnant and has her baby. This is the major relationship plot line although there are other developments. One criminal plot thread involves a possible imposter gaining an inheritance meant for someone else. Another crime element is the slander and libel of a beauty shop owner. The themes recurring in both plot elements are old Botswana vs modern Botswana and the superstitions which have to be overcome. Listening is a joy in part because Lisette Lecat has been the narrator all through the years and hers has become the very friendly voices of Precious Ramotswe, Mma Makutsi, and all the others. She’s very, very good.